I have a whole PILE of new books to wade through with you guys, but I have to read a few of them first and I have to get a few styling props for some of the others, and I'm waiting for that stuff to arrive. OH BOOKS, why must they be so complicated?? 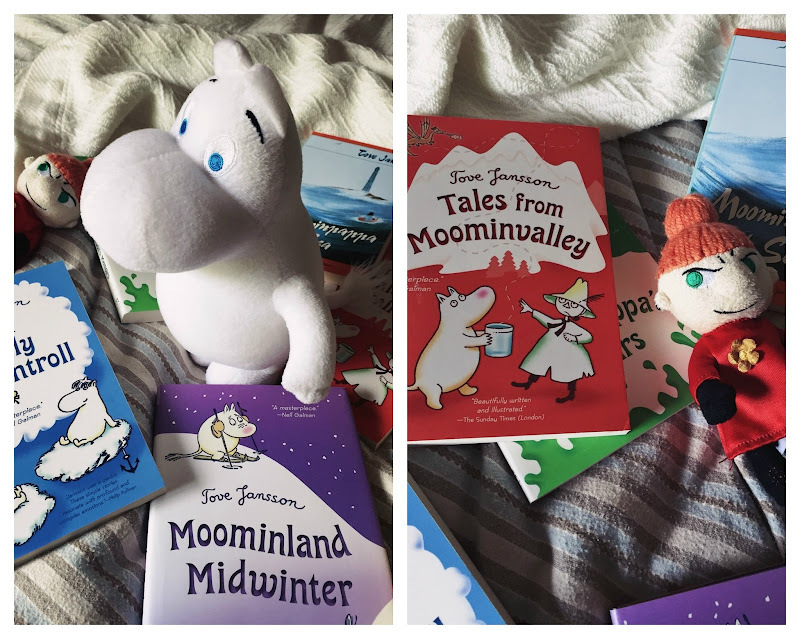 But in the meantime, here's me, once again giving a public service announcement on Tove Jansson's Moomintroll books. I've mentioned them again and again and again (to lazy to link this evening, but take my word on it) and I'll keep on talking about them because someone may stumble across my blog who hasn't heard me yammering away on the topic and then they'll read my latest Moomin post and be amazed at the world of Moomins and off happily away they'll go, getting their Very Own Moomin book, and I'll have done a MIGHTY FINE THING for the world. Did you get all that? As you can see, we have all of them. I had to get brand new copies because mine from my childhood fell apart. 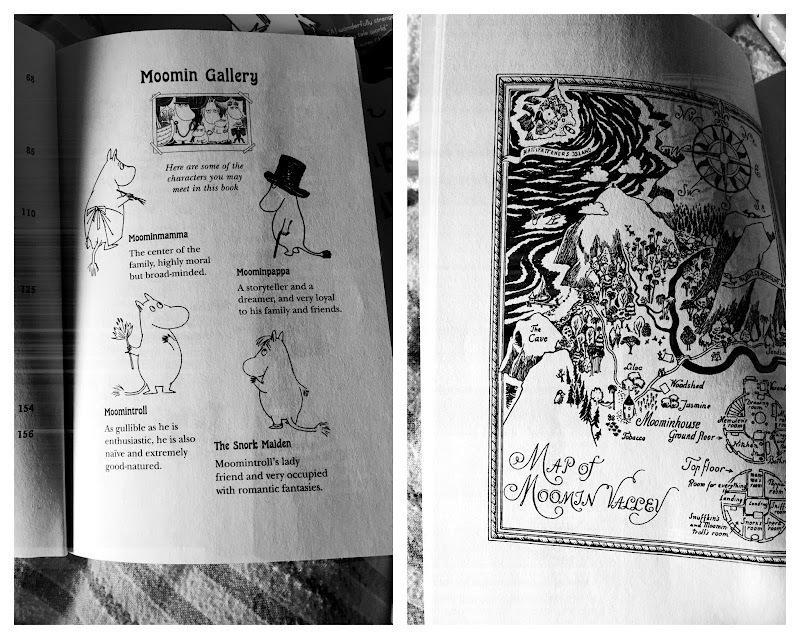 For those that aren't up to speed, Moomins are friendly little creatures who live in the wild mountains on Finland. They have adventures. That's what they do. They also like tea and treats. The main family that anchors the series is the Moomintroll clan, which consists of Moominpapa, Moominmama (who carries her purse everywhere because everything but the kitchen sink is in it) and their son, Moomintroll. Although there are only three of them, they have some permanent friends who reside with/near them - Snuffkin (Moomintroll's bestie), the Snorkmaiden (who looks just like Moomintroll only she's a girl with bangs. Also she loves Moomintroll. ), Mymble (a nervous girl who likes to clean, oh wait no, the one who loves cleaning is the Fillyjonk) and her tiny sister, Little My, who I'll follow up on further down. There are loads of other assorted friends and frenemies who feature in the stories - including characters like Too-ticky and Sorry-oo, and Thingumy and Bob. 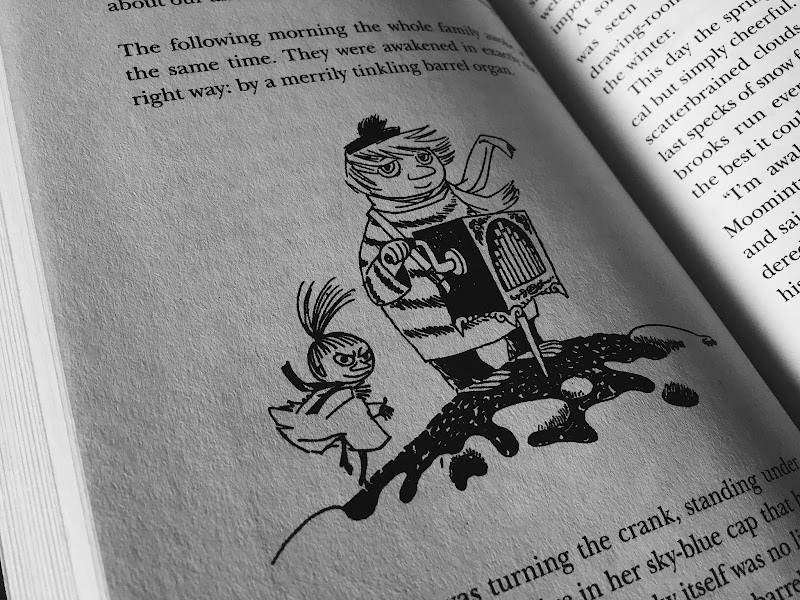 And even someone named The Ancestor, who lives behind Moominmama's stove. See? The Snorkmaiden is basically Moomintroll's twin, only with bangs. 'Moomintroll's lady friend and very occupied with romantic fantasies' -- don't you love it?? Little My is my favorite. I think she might be everyone's favorite, given the amount of Moomin merchandise I see featuring her. The above description is spot on. You don't mess with Little My. She'll leave you hanging upside down nine ways to Sunday if you get on the wrong side of her. I LOVE HER SO MUCH. 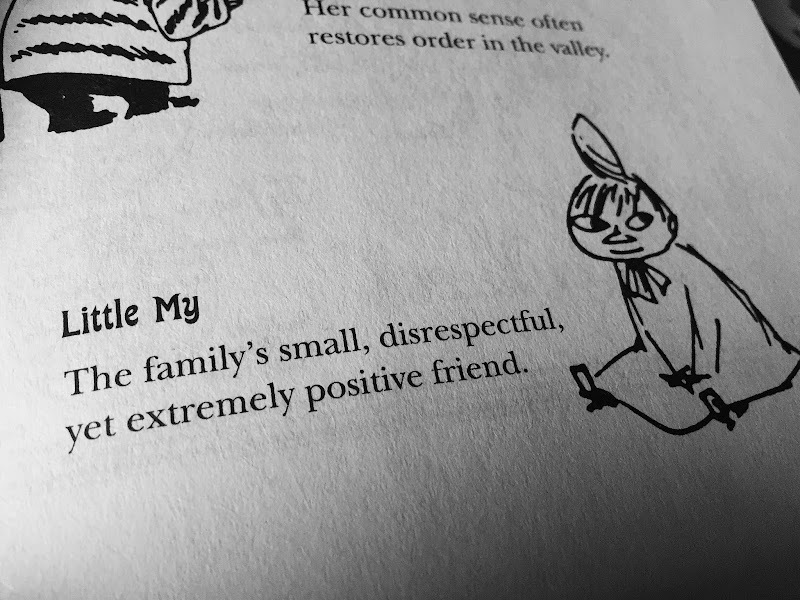 Little My is my spirit animal. 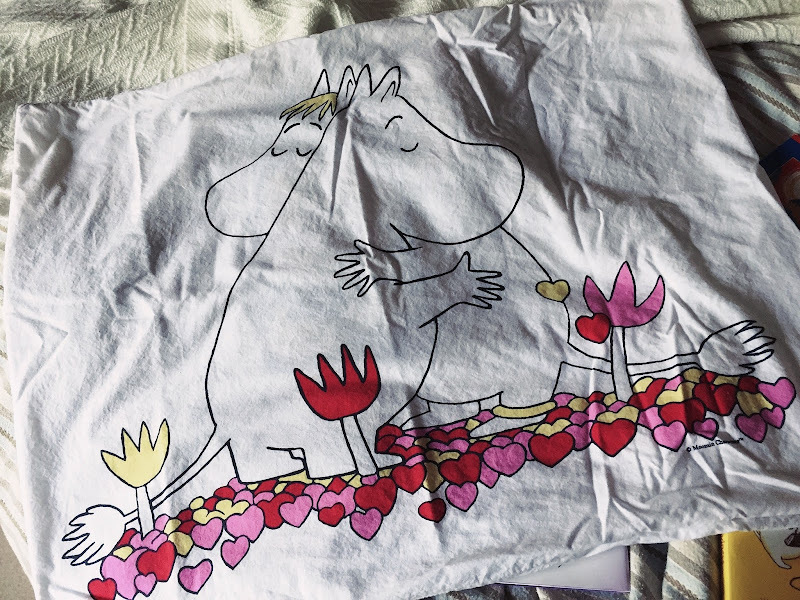 As you can see, above and below - we have some Moomin gear. My father went to Finland on a business trip a couple of years ago. I told him to please get us some Moomin stuff, and I think I did not use the word please. He had no clue what the deal was about Moomins. He was amazed to discover "this stuff was everywhere!". Uh, YEAH. Moomins are hugely popular in Europe, less so in the States. I'm not sure why. Anyway, he brought us back (yes I claim 50% ownership along with Julia) stickers, a pillow case (ah young love! isn't it adorable? ), and a Moomintroll stuffy and BEST OF ALL -- a tiny Little My doll. What makes these books so special? I think because...there's nothing else like them in children's literature. I seriously have not ever come across anything like their sweet, whimsical vibe. 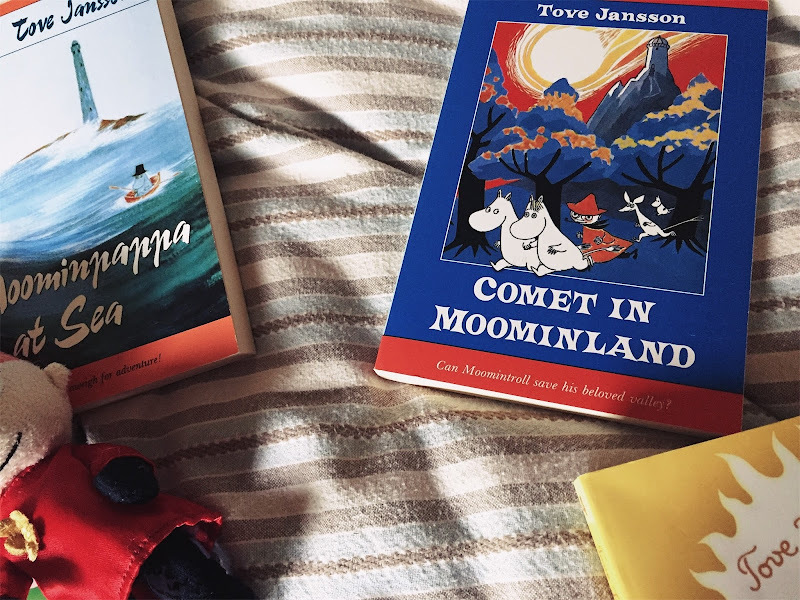 Comets may threaten to fall, the Moomin house might flood, nobody might know their lines when the Moomins turn into theater performers, but those Moomins keep trudging happily along in the most civilized and polite fashion. I think these books really hit the sweet spot for kiddos ages 8-10. Although they look like little creatures that a 5 year old would enjoy, the subtle humor exhibited throughout the books is really best suited to a slightly older kid - 3rd through 5th grades. So please. Hear my plea again. 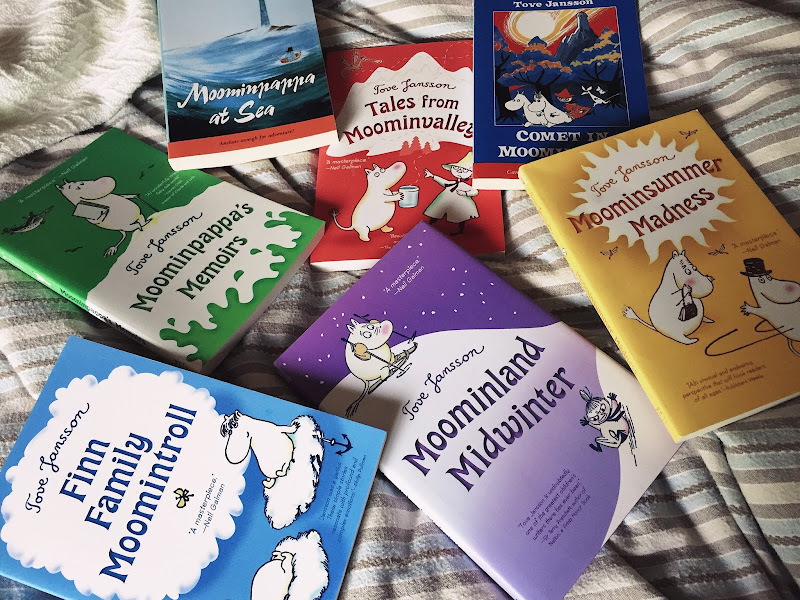 And if you don't, you can hear it next year, because I do some kind of Moomin post every year and I'll do so as long as I keep up this blog.....go get yo-self some Moomin books! 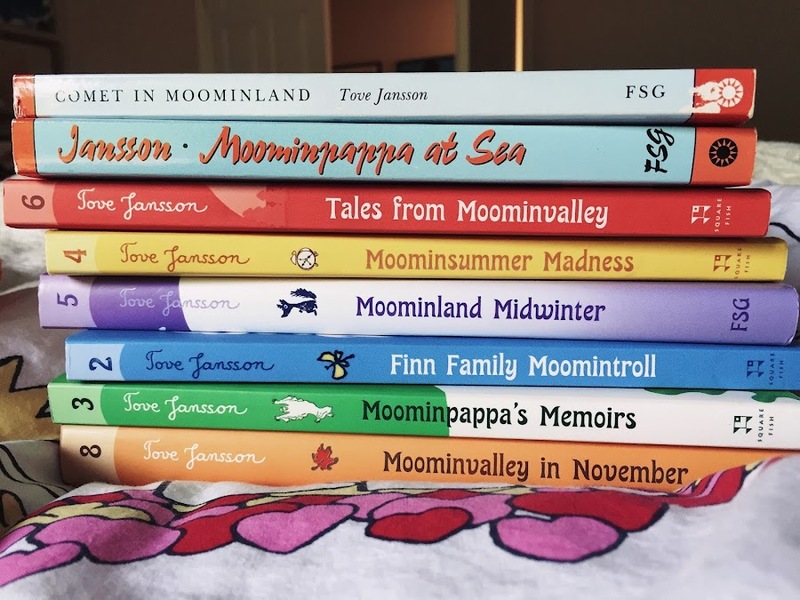 My favorite is the first one, Finn Family Moomintroll. I also love a Comet in Moominland. And the winter one. They're all great! Thank you for the reminder of these fantastic looking books! I have to make sure I remember them when my six year-old is a bit older! Megan - if you go look around on Amazon - there are some Moomin picturebooks available that are just right for Kinder and Preschool aged kids! I got several of them for Julia!